Picture it: you’re outside on a rainy, grey day; your teeth chatter as your body shivers from the chill. As you exhale, your breath floats up in little puffs of soft vapor. Goosebumps rise on your arms. But lucky you— you are about to step into one of the heavenly hot springs you found as you traveled the Scenic Highway 7BC. There’s nothing quite like the welcoming, soothing waters of a natural hot spring, washing over you and embracing you like a toasty warm blanket! They say nothing good comes easy, and that’s the case for getting to some of these hidden gems. 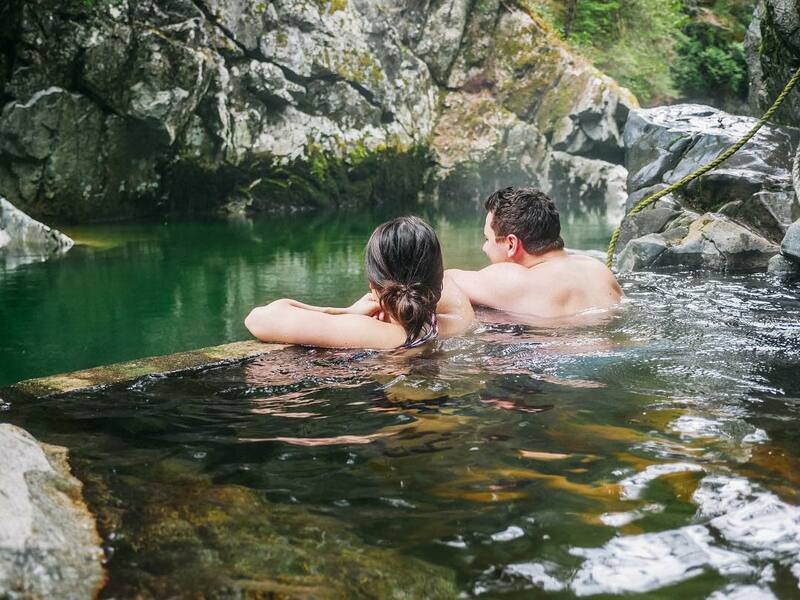 However, if you have a rugged vehicle and a robust sense of adventure, you may be able to get to a number of hot springs that are scattered throughout the backcountry along the Scenic7BC highway! How many of you can say you’ve been to all seven on this list? 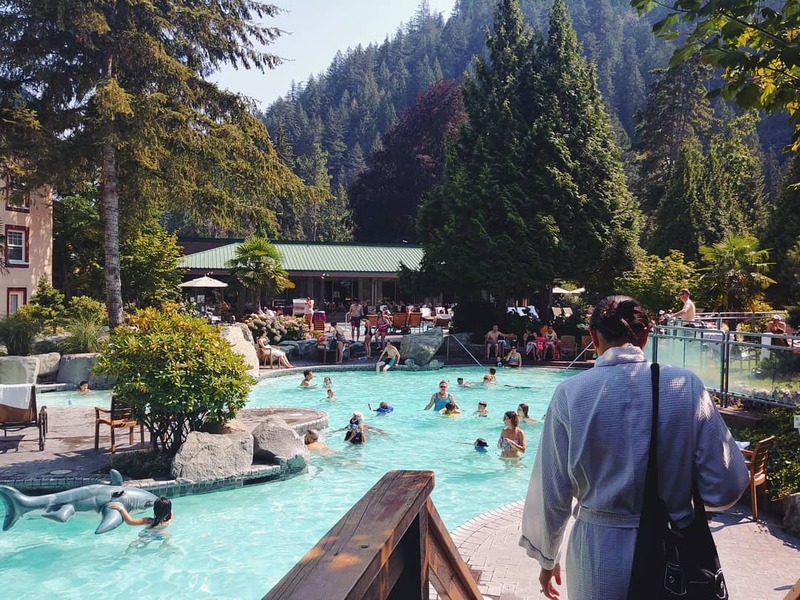 Here are seven amazing hot springs you need to experience between Maple Ridge and Harrison Lake! You’ll want to have a 4×4 to get to this destination, as there are many pot holes, ruts, rocks, and during rainy season, an (over)abundance of puddles and mud. To get there, take a drive up East Harrison Forest Service Road until you reach Clear Creek Forest Service Road. (Be cautious as there are often logging trucks travelling along East Harrison). Approximately 11 km up Clear Creek FSR, you will arrive at Clear Creek Hot Springs on your right. Walk along a short pathway made of logs, and you’ll find 3 hot tubs nestled in beautiful old growth forest. The hot tubs and set up are more “rustic” than some of the other hot springs; and because it is one of the more accessible hot springs, it’s rare to have the area to yourself. But it’s still a great spot to sit back and soak while taking in the delightful forest and mountain views. Skookumchuck is most often accessed via Highway 99. Once you turn onto the In-shuck-ch Forest Service Road, you’ll have a very long and picturesque drive along Lillooet Lake. Bring your camera, as there are some stunning vistas, not only of the gorgeous lake but the towering Coastal Mountain Range which borders it. When you reach the end of the lake and start driving along the river, you’ll come upon the Skookumchuck (T’sek) Hot Springs Campground. What better combination than camping and hot springs? Fees are in effect whether you are going for the day or plan on camping in one the beautiful sites along the river. 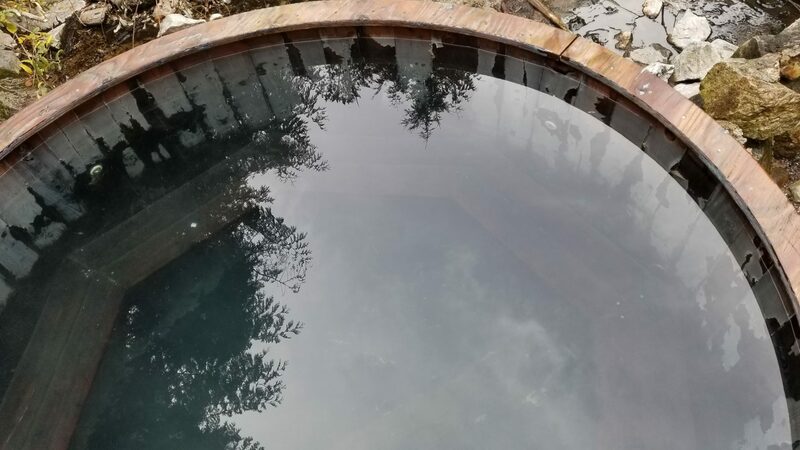 The hot springs start in a (too hot to use) natural pool, and the water travels through a network of pipes to a variety of tubs of different sizes and shapes, from rough and rustic to the charming main tub, which is covered by a wooden A-frame structure. *Note: Skookumchuck and Sloquet Hot Springs used to be accessible from a West Harrison Forest Service Road, but flood damage made the road impassible from that side. Plans are underway to re-open the road. Currently you can visit these two springs via Pemberton/Lillooet on the Lower Lillooet River FSR. Check here to get the latest updates on this and any forest service road in BC. The Facebook group In-shuck-ch Road Updates is a great resource for road condition information on the In-shuck-ch FSR. Access to Sloquet is the same as Skookumchuck, via the In-shuck-ch Forest Service Road. Make sure to bring cash as there is a small fee for day use of the hot springs, and there are no options for debit or credit card. As well, overnight camping is available at 20 campsites on a first-come, first served basis. You’ll not find any rustic hot tubs here; instead, a multitude of enticing, clear, shallow pools amongst rugged rocks and boulders. Both Sloquet and Skookumchuck are the perfect places to go off grid and escape the rat race as there’s no cell service in either place. For more information, please visit Sloquet Hot Springs’ site. Alongside scenic Harrison Lake, the locals found a spot where hot water bubbles out of the ground near the main hot spring source. Some local hot spring enthusiasts have dug holes and built up rocks around them, and thus was born the “Harrison Hobo Hot Springs”. During spring and early summer, rains and spring run-off increase the lake levels, so the lower Hobo pool is underwater. The other pool is above the historic hot spring source building. The Hobo Hot Springs can get very hot, so it’s recommended to bring a bucket to add cold water from the lake or nearby creek. Looking for some soothing hot springs that are easy to find? Harrison Hot Springs Public Pool is what you’re looking for! 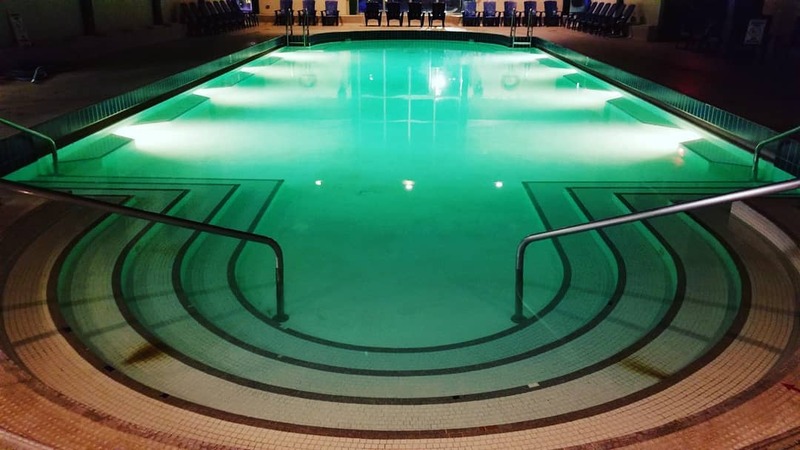 Near the beautiful waterfront in the town of Harrison Hot Springs, the indoor public pool is fed by the same hot mineral springs as the pools in the Harrison Hot Springs Resort. Everyone who visits Harrison Hot Springs can relax, unwind, and reap the benefits of therapeutic mineral waters! For more information, click here. 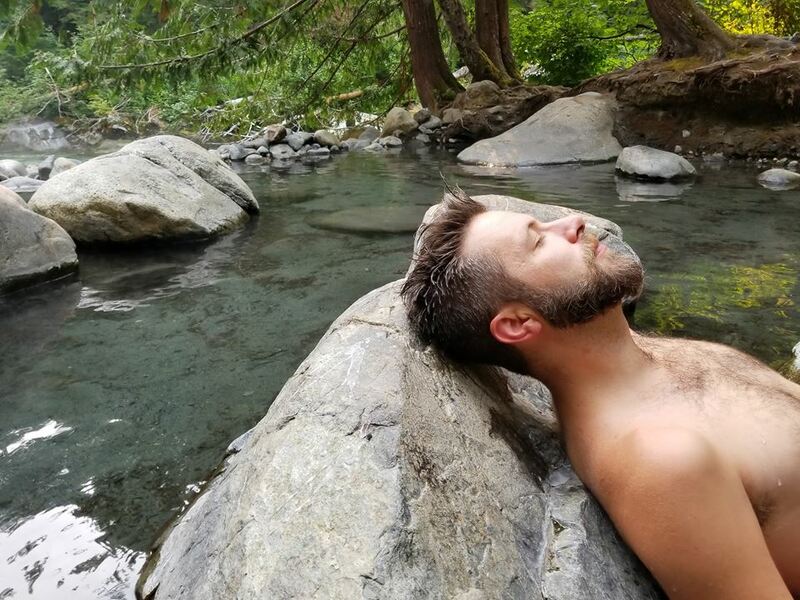 Pitt River Hot Springs is considered to be one of the most pristine hot springs in all of BC (probably because it is so challenging to get to). If you’ve made it there for a relaxing soak, you’ve definitely earned it! Starting from Grant Narrows Regional Park, you have to go north all the way across the lake to the North End Dock. If you’re up for an epic journey, this can be done by canoe/kayak. Much faster though, would be to take a motor boat across. If you are brave enough to canoe, we hope you ate a hearty breakfast, because it’s a 28 km paddle, typically taking 6+ hours, on an open lake where it’s often windy with choppy waves. If you are fortunate enough to have a motorboat, it’s about a 45-minute ride. Most people bring their bicycles across on the boat, to make it through the next leg of the journey much faster than walking. Once you’ve reached the North End Dock, you have to travel another 22 km to get to a bridge over the hot springs. From the bridge, it’s just a quick walk to the hot springs. However, you will have to descend a steep and rocky embankment to get to the pools below. Luckily there are 2 ropes in place to help you get down. It is a very unique and gorgeous spot as there are 2 pools right beside the sparkling blue-green (and very cold) Pitt River. You’ll feel nestled and relaxed between the tall canyon walls, the rocks of which are covered in lavish green moss. Since it’s such an arduous journey to get there, chances are very likely that you’ll have the hot springs all to yourself! If you don’t have the time (or inclination) to journey over hill and dale to find hot springs and are looking for something more sophisticated than the typical backcountry experience, treat yourself to a relaxing stay at the beautiful Harrison Hot Springs Resort & Spa! Here you will find five hot spring-fed mineral pools, each a different temperature. Two pools are indoor, three pools are outdoor. You’ll have plenty of space to soak up the mineral rich water: the outdoor family pool itself is over 4,000 sq. feet with lovely waterfall, foliage, and rock features. For more details, click here. 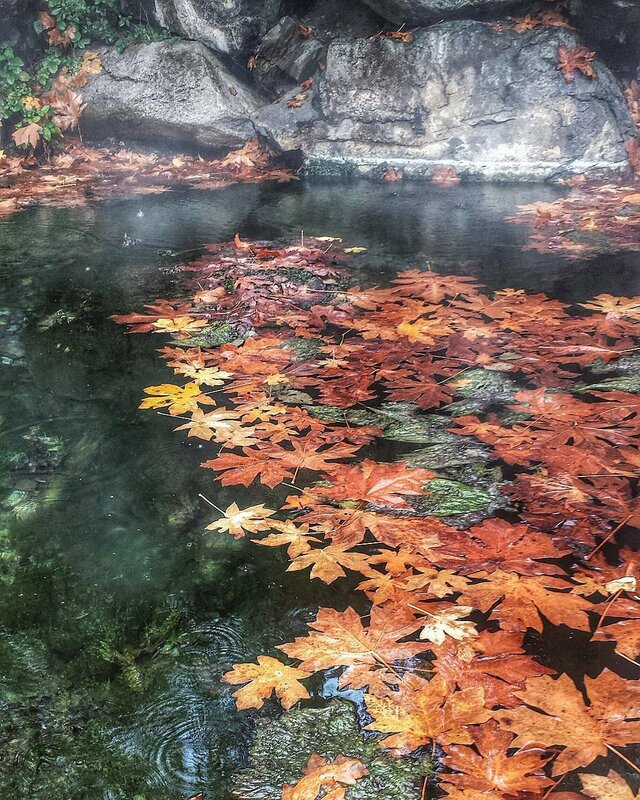 The location of these Hot Springs is kept under wraps by the few who have found it. As such, there are no signs of human presence at these hot springs… they are undeveloped and all-natural. While rumoured to be on Frank Creek, near Sloquet and Skookumchuck Hot Springs, its exact location remains a mystery to the general public. 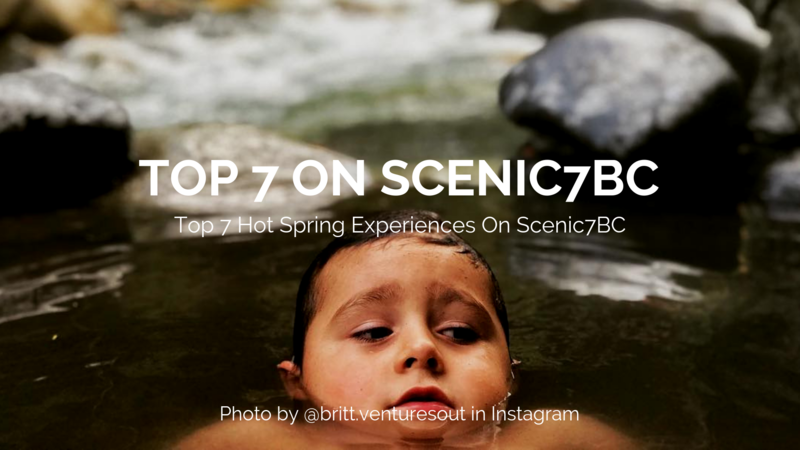 Learn more about these Hot Springs destinations and other must-see road trip stops along the Scenic 7 Highway on the Scenic7BC website.